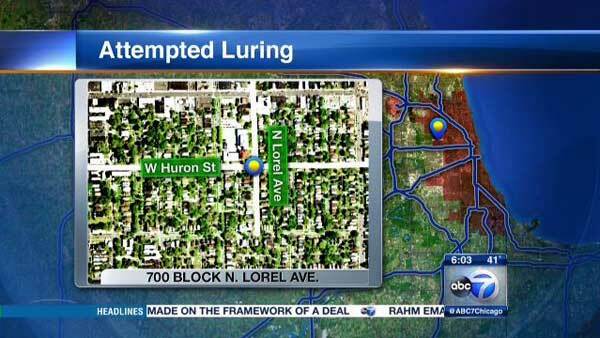 CHICAGO (WLS) -- A man tried to lure two young boys into his van using candy in Chicago's Austin neighborhood, police said. Authorities said two 9-year-old boys left school in the 700-block of North Lorel Avenue between 3:15 p.m. and 3:30 p.m. Monday. A white van, with windows on the rear doors, pulled up as they walked south toward West Huron Street. The boys told police the driver got out of the vehicle and offered them candy he had in his hand. A man in the front passenger seat stayed in the vehicle. The children didn't say anything to the driver and kept walking. Police said when the van started following them, the boys ran home and told family members what happened. The suspect is described as an African American man in his 30s. He was about 6 ft. tall and weighed around 180 lbs. He was wearing sunglasses, a black hat a black hooded sweatshirt under a dark-colored jacket and dark-colored pants. Anyone with information regarding this incident should contact Area North detectives at (312) 744-8266.